Have you ever tried to record any video footage from your screen in the past? Although screen recording (or screencasting as it is sometimes known) has been around for some time, many people haven’t used it – both because it can be a bit technical, and because they don’t see how it can help them. The fact of the matter is however that being able to record videos from your screen can be very useful. Not only can you use it to create a wide range of content, but you could also save content from your screen and learn how to record a webinar, online streaming video, and so on. As its name implies, Movavi Screen Recorder is a tool that will let you record videos from your screen. The reason why you should consider trying it out is simple: It is easy and accessible, regardless of your level of experience. Simply put Movavi Screen Recorder will make it a piece of cake to set up and start recording any video that you need from your screen. It has a clean and simple user interface that you can familiarize yourself within a matter of minutes, and that will place all the options that you need right there in front of you. On the whole, it has a no-frills approach compared to many other screen recorders and is focused solely on making sure that you’re able to capture the video footage that you require. That makes Movavi Screen Recorder more straightforward and lets it avoid being bloated by unnecessary tools and features. While Movavi Screen Recorder’s no-frills approach does mean that it isn’t packed to the brim with features, it does have them where it matters most. In fact, as you explore its features you’ll start to see just how versatile it is. Define the part of your screen that you want to capture, whether it is a specific frame, a program window, or the entire display. Adjust the frame rate of the video recording to up to 60 frames per second for smooth and high-quality videos. Select the audio sources that you want to record, including the system audio or audio from external devices such as a microphone. Control the volume levels of each audio source individually. 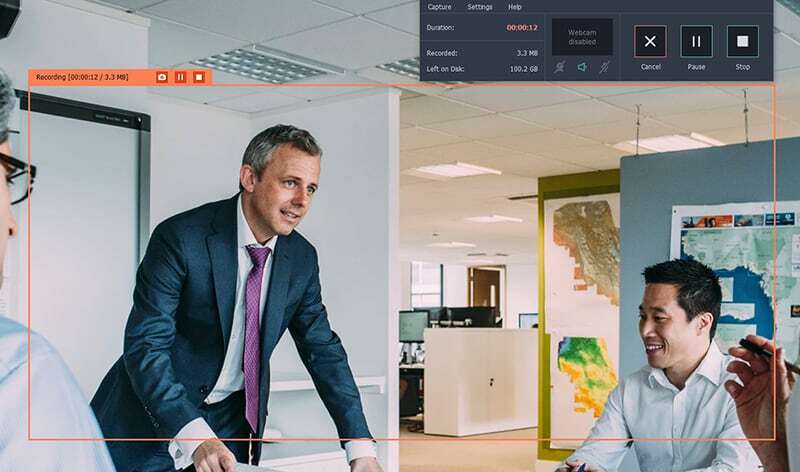 Capture video footage from a webcam and overlay it on your video while controlling its resolution, frame rate, size and position. Trim out any unwanted footage from the video recording after it is complete. Automate the recording by setting up a timer to stop it after a certain duration or scheduling a specific time to start then stop recording. Use various options to make it possible to capture keyboard actions, make mouse actions more visible, or hide the cursor completely. As you can see despite its simple outward appearances and design, Movavi Screen Recorder does have its fair share of features where it matters most. With its capabilities, you’ll have a versatile tool that you can adjust to fit your requirements as and when you need to. All said and done Movavi Screen Recorder is a great option if you want to start recording your screen quickly and effectively without having to jump through any hoops or go through a steep learning curve. More importantly, it is an option that will allow you to not only grab the video for your own personal use but capture video footage to create high-quality content if need be. Mahendra Bajiya is a blogger who frequently uses screen recording to create a wide range of video content. He enjoys trying out new tools, and producing different types of content with them.